Biological aging and interventionary strategies are investigated with the eventual goal of extending healthy human lifespan and minimizing the incidence of diseases associated with aging. Biogerontologists, evolutionary biologists, biodemographers, scientists in related basic research, clinicians, and dieticians came together in Istanbul, Turkey, to share their research and discuss the latest developments in this rapidly advancing field. This volume presents chapters representative of the highlights of the meeting, including contributions in the following areas: (1) biological and nonbiological factors affecting lifespan and the quality of life; (2) ethical and social issues related to lifespan and health-span extension; (3) novel areas of understanding aging -- physiological, cellular, and molecular aspects; (4) new technologies to understand and modulate aging; (5) the latest successful approaches in the prevention and treatment of age-related diseases; and (6) aging intervention, prevention, and modulation by genes, natural and synthetic molecules, and lifestyle modifications. Suresh Rattan is a biogerontologist - a researcher in the field of biology of ageing, biogerontology. Serif Akman is the editor of Biogerontology: Mechanisms and Interventions, Volume 1100, published by Wiley. 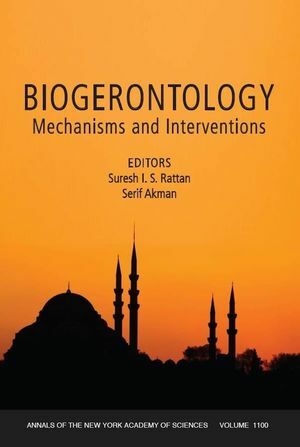 Preface: Biogerontology: Mechanisms and Interventions: Suresh I. S. Rattan and Serif Akman. Part I: Aging, Longevity and Evolution:. 1. Biological Aging is No Longer an Unsolved Problem: Leonard Hayflick. 2. Modalities of Gene Action Predicted by the Classical Evolutionary Biological Theory of Aging: George M. Martin. 3. Genetics of Healthy Aging in Europe: The EU-Integrated Project GEHA (Genetics of Healthy Aging): Claudio Franceschi, Vladyslav Bezrukov, Helene Blanche, Lars Bolund, Kaare Christensen, Giovanna De Benedictis, Luca Deiana, Efsthatios Gonos, Antti Hervonen, Huanning Yang, Bernard Jeune, Tom B. L. Kirkwood, Peter Kristensen, Alberta Leon, Pier Giuseppe Pelicci, Leena Peltonen, Michel Poulain, Irene Maeve Rea, Jose Remacle, Jean Marie Robine, Stefan Schreiber, Ewa Sikora, Pieternella Eline Slagboom, Liana Spazzafumo, Maria Antonietta Stazi, Olivier Toussaint, and James W. Vaupel. 4. Postponement of Postmenopausal Mortality Acceleration in Low-Mortality Populations: Eugene M. G. Milne. 5. Cross-Talk between Aging and Cancer: The Epigenetic Language: Mario F. Fraga, Ruben Agrelo, and Manel Esteller. 6. Molecular Chaperones and the Epigenetics of Longevity and Cancer Resistance: Jens Kroll. Part II: Immunity, Aging and Diseases:. 7. Regulation of Human Life Histories: The Role of the Inflammatory Host Response: David Van Bodegom, Linda May, Hans J. Meij, and Rudi G. J. Westendorp. 8. Do Membrane Rafts Contribute to Human Immunosenescence? : Andru Tomoiu, Anis Larbi, Carl Fortin, Gilles Dupuis, and Tamas Fulop, Jr.
9. Zinc and Inflammatory/Immune Response in Aging: Sonya Vasto, Eugenio Mocchegiani, Marco Malavolta, Irene Cuppari, Florinda Listi, Domenico Nuzzo, Vito Ditta, Giuseppina Candore, and Calogero Caruso. 10. Genetics of Inflammation in Age-Related Atherosclerosis: Its Relevance to Pharmacogenomics: Maria Paola Grimaldi, Sonya Vasto, Carmela Rita Balistreri, Daniele Di Carlo, Marco Caruso, Egle Incalcaterra, Domenico Lio, Calogero Caruso, and Giuseppina Candore. 11. PECAM-1/CD31 in Infarction and Longevity: Florinda Listi, Calogero Caruso, Carmela Rita Balistreri, Maria Paola Grimaldi, Marco Caruso, Gregorio Caimi, Enrico Hoffmann, Domenico Lio, and Giuseppina Candore. 12. Plasma Levels of Apolipoprotein E and Risk of Stroke in Old Age: Peter Van Vliet, Simon P. Mooijaart, Anton J. M. De Craen, Patrick C. N. Rensen, Diana Van Heemst, and Rudi G. J. Westendorp. 13. Plasma Levels of Apolipoprotein E and Cognitive Function in Old Age: Simon P. Mooijaart, Peter Van Vliet, Diana Van Heemst, Patrick C. N. Rensen, Jimmy F. P. Berbee, Jelle Jolles, Anton J. M. De Craen, and Rudi G. J. Westendorp. 14. CCR5 Receptor: Biologic and Genetic Implications in Age-Related Diseases: Carmela Rita Balistreri, Calogero Caruso, Maria Paola Grimaldi, Florinda Listi, Sonya Vasto, Valentina Orlando, Anna Maria Campagna, Domenico Lio, and Giuseppina Candore. 15. Lumbar Spinal Stenosis in Elderly Patients: Hulagu Kaptan, Omur Kasimcan, Kutay Cakiroglu, Mustafa Necmi Ilhan, and Celal Kilic. 16. Comparison of Lipoprotein(a) Levels between Elderly and Middle-Aged Men with Coronary Artery Disease: Hulya Cicek, Sibel Bayil, Yasemin Zer, Ahmet Celik, and Iclal Geyikli. 17. Chitotriosidase Levels in Healthy Elderly Subjects: Ismail Kurt, Dilek Abasli, Murat Cihan, Muhittin A. Serdar, Abdullah Olgun, Ercan Saruhan, and M. Kemal Erbil. 18. Genetic Variation in the Interleukin-10 Gene Promoter and Risk of Coronary and Cerebrovascular Events: The PROSPER Study: S. Trompet, D. Pons, A. J. M. De Craen, P. Slagboom, J. Shepherd, G. J. Blauw, M. B. Murphy, S. M. Cobbe, E.L.E.M. Bollen, B. M. Buckley, I. Ford, M. Hyland, A. Gaw, P. W. Macfarlane, C. J. Packard, J. Norrie, I. J. Perry, D. J. Stott, B. J. Sweeney, C. Twomey, R. G. J. Westendorp, J. W. Jukema, and on behalf of the PROSPER Group. 19. Antioxidant Enzymes and Diabetic Retinopathy: Zuhal Yildirim, N. Irem Ucgun, Nedret Kilic, E. Gursel, and Aylin Sepici-Dincel. 20. Pseudoexfoliation Syndrome and Trace Elements: Zuhal Yildirim, N. Irem Ucgun, Nedret Kilic, E. Gursel, and Aylin Sepici-Dincel. 21. The Importance of Serum Lipids in Exudative Diabetic Macular Edema in Type 2 Diabetic Patients: Nil Irem Ucgun, Zuhal Yildirim, Nedret Kilic, and Emin Gursel. 22. Age-Related Paraoxonase Activity Changes in Turkish Population: Ercan Saruhan, Abdullah Olgun, Kamile Ozturk, Serif Akman, and M. Kemal Erbil. 23. Evaluation of Measurement Uncertainty of Glucose in Clinical Chemistry: B. Bercik Inal, M. Koldas, H. Inal, C. Cockun, A. Gumus, and Y. Doventas. Part III: Molecular and Cellular Aging:. 24. Mitochondrial DNA Mutations and Aging: Kim J. Krishnan, Laura C. Greaves, Amy K. Reeve, and Douglass M. Turnbull. 25. Mitochondrial DNA-Deficient Models and Aging: Abdullah Olgun and Serif Akman. 26. Mitochondrial DNA Alterations in Aging: Kamile Ozturk, Abdullah Olgun, Ercan Saruhan, Aydan Ergen, Serif Akman, and M. Kemal Erbil. 27. Alterations to Nuclear Architecture and Genome Behavior in Senescent Cells: Ishita S. Mehta, Martin Figgitt, Craig S. Clements, Ian R. Kill, and Joanna M. Bridger. 28. PGC-1α-Induced Mitochondrial Alterations in 3T3 Fibroblast Cells: Huiyun Liang, Yidong Bai, Youfen Li, Arlan Richardson, and Walter F. Ward. 29. Proteasome and Photoaging: The Effects of UV Irradiation: Anne-Laure Bulteau, Marielle Moreau, Carine Nizard, and Bertrand Friguet. 30. Proteome Alterations in Rat Mitochondria Caused by Aging: Norbert A. Dencher, Monika Frenzel, Nicole H. Reifschneider, Michiru Sugawa, and Frank Krause. 31. The Role of the MORF/MRG Family of Genes in Cell Growth, Differentiation, DNA Repair, and Thereby Aging: Andreana N. Pena and Olivia M. Pereira-Smith. 32. Involvement of Mortalin in Cellular Senescence from the Perspective of its Mitochondrial Import, Chaperone, and Oxidative Stress Management Functions: Tomoko Yaguchi, Satoshi Aida, Sunil C. Kaul, and Renu Wadhwa. 33. CARF Binds to Three Members (ARF, p53, and HDM2) of the p53 Tumor-Suppressor Pathway: Hasan M. Kamrul, Renu Wadhwa, and Sunil C. Kaul. 34. Knocking Down p53 with siRNA Does Not Affect the Overexpression of p21WAF-1 after Exposure of IMR-90 hTERT Fibroblasts to a Sublethal Concentration of H2O2 Leading to Premature Senescence: Stephanie Zdanov, Florence Debacq-Chainiaux, and Olivier Toussaint. 35. β-Galactosidase Activity as a Biomarker of Replicative Senescence during the Course of Human Fibroblast Cultures: Andrea B. Maier, Rudi G. J. Westendorp, and Diana Van Heemst. 36. A Dual Role of p21 in Stem Cell Aging: Zhenyu Ju, Aaheli Roy Choudhury, and K. Lenhard Rudolph. 37. Age-Dependent Effects on Functional Aspects in Human Satellite Cells: S. Beccafico, C. Puglielli, T. Pietrangelo, R. Bellomo, G. Fano, and S. Fulle. 38. Vascular Smooth Muscle and Endothelial Functions in Aging: Oguzhan Yildiz. 39. The Differentiation-Associated Linker Histone, H1.0, during the In Vitro Aging and Senescence of Human Diploid Fibroblasts: Kalliope E. Sekeri-Pataryas and Thomae G. Sourlingas. 40. Quantum Dot-Based Mortalin Staining as a Visual Assay for Detection of Induced Senescence (i-Senescence) in Cancer Cells: Zeenia Kaul, Tomoko Yaguchi, Hiroshi X. Chiura, Sunil C. Kaul, and Renu Wadhwa. 41. Markers of Oxidative Stress in Erythrocytes during Aging in Humans: Syed Ibrahim Rizvi and Pawan Kumar Maurya. 42. Methionine Sulfoxide Reduction and the Aging Process: Ahmet Koc and Vadim N. Gladyshev. 43. Activation of Pericentromeric and Telomeric Heterochromatin in Cultured Lymphocytes from Old Individuals: Teimuraz Lezhava and Tina Jokhadze. 44. Deuteronation and Aging: Abdullah Olgun, Kamile Ozturk, Selda Bayir, Serif Akman, and M. Kemal Erbil. 45. Hemodialysis and Protein Oxidation Products: Cihan Coskun, Alev Kural, Yasemin Doventas, Macit Koldas, Humeyra Ozturk, Berrin Bercik Inal, and Alper Gumus. 46. The Natural Biogerontology Portfolio: “Defeating Aging” as a Multi-Stage Ultra-Grand Challenge: Aubrey D. N. J. De Grey. 47. Hormetic Prevention of Molecular Damage during Cellular Aging of Human Skin Fibroblasts and Keratinocytes: Suresh I. S. Rattan and Rehab E. Ali. 48. Beneficial Biochemical Outcomes of Late-Onset Dietary Restriction in Rodents: Sataro Goto, Ryoya Takahashi, Zsolt Radak, and Ramesh Sharma. 49. Adult-Limited Dietary Restriction Slows Gompertzian Aging in Caenorhabditis elegans: Isabelle Lenaerts, Sylvie Van Eygen, and Jacques Van Fleteren. 50. Prior Chronic in Vivo Glucocorticoid Excess Leads to an Anabolic Phenotype and an Extension of Cellular Life Span of Skin Fibroblasts in Vitro: Dimitris Kletsas, Harris Pratsinis, Vassiliki Gioni, Konstantinos Pilichos, Andreas M. Yiacoumettis, and Stylianos Tsagarakis. 51. The Role of Cellular Senescence in Werner Syndrome: Toward Therapeutic Intervention in Human Premature Aging: Terence Davis, Fiona S. Wyllie, Michal J. Rokicki, Mark C. Bagley, and David Kipling. 52. Fruit Polyphenols and Their Effects on Neuronal Signaling and Behavior in Senescence: James A. Joseph, Barbara Shukitt-Hale, and Francis C. Lau. 53. Psoralea corylifolia L. Inhibits Mitochondrial Complex I and Proteasome Activities in SH-SY5Y Cells: Soon Yew Tang, Jan Gruber, Kim Ping Wong, and Barry Halliwell. 54. Improvement of Immune Cell Functions in Aged Mice Treated for 5 Weeks with Soybean Isoflavones: Isabel Baeza, Nuria M. De Castro, Carmen Alvarado, Pedro Alvarez, Lorena Arranz, Julian Bayon, and Monica De La Fuente. 55. Effects of Deleting Mitochondrial Antioxidant Genes on Life Span: Ercan Selcuk Unlu and Ahmet Koc. 56. The Effect of Intrahippocampal Beta Amyloid (1-42) Peptide Injection on Oxidant and Antioxidant Status in Rat Brain: Ferihan Cetin and Sibel Dincer. 57. Glyoxal-Induced Premature Senescence in Human Fibroblasts: Henrik Sejersen and Suresh I. S. Rattan. 58. Sugar-Induced Premature Aging and Altered Differentiation in Human Epidermal Keratinocytes: Ulrich Berge, Juliane Behrens, and Suresh I. S. Rattan. 59. Evidence for a Trade-Off between Survival and Fitness Caused by Resveratrol Treatment of Caenorhabditis elegans: Jan Gruber, Soon Yew Tang, and Barry Halliwell. 60. Influence of Aging and Enriched Environment on Motor Activity and Emotional Responses in Mice: Claustro Zambrana, Eva M. Marco, Lorena Arranz, Nuria M. De Castro, Maria Paz Viveros and Monica De La Fuente. 61. Effects of Taurine in Cellular Responses to Oxidative Stress in Young and Middle-Aged Rat Liver: Zuhal Yildirim, Nedret Kilic, C¸ Igdem Ozer, Aydan Babul, Gulnur Take, and Deniz Erdogan.